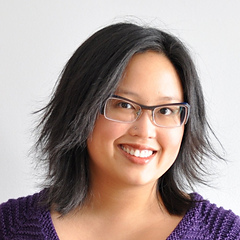 Heather Zoppetti is a knitwear designer, instructor, and author of Everyday Lace (Interweave, 2014). 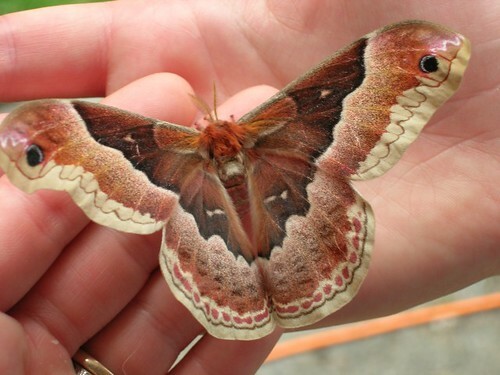 Her patterns have been published in many Interweave publications such as Knits, Knitscene, and Jane Austen Knits, and by yarn companies such as Manos del Uruguay, Baah Yarns, The Alpaca Yarn Company, Reywa Fibers, and Universal Yarns. She is also the owner and founder of Stitch Sprouts, a company dedicated to helping your stitches grow. Heather lives and teaches in Lancaster, PA, and be found at http://www.hzoppettidesigns.com and http://www.stitchsprouts.com. 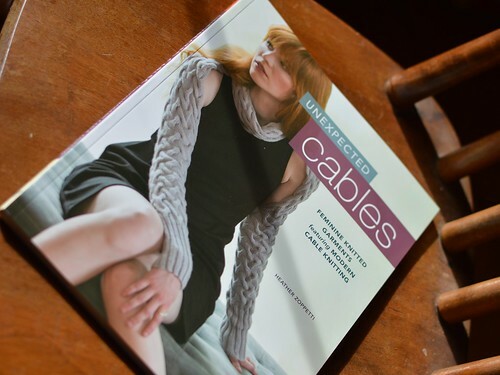 I received a copy of Unexpected Cables by my good friend Heather in the mail a couple weeks ago. It’s such a pretty book I’ve been waiting and waiting for a chance to share it with you! As you’re well aware, I love cables. Love love love them. So this book grabbed me right from the start. Heather does such unique and pretty things with cables. She makes things I would never think of and would love a chance to try. And that’s what is awesome about knitting – there’s always something new. And this book is full of more than a few new somethings. 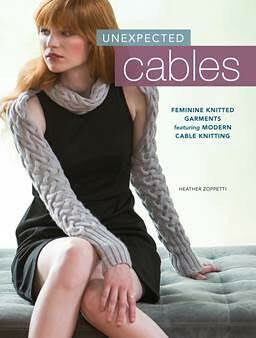 I love this whole chapter on lace and cables. Lace is the hardest element for me to design with, but Heather makes her ideas look easy and natural. I’ve got an interview with Heather to share today, and her lovely publishers have given me permission to share some details from one of my favorite patterns too! 1. How did you first get started designing? I first started designing how so many other designers start…just by changing other patterns. Eventually I felt confident that I could create patterns on my own. I find inspiration everywhere. Sometimes it might be just a color or a tile pattern I see out and about. Other times a specific stitch pattern might call to me. I try to be observant and always on the lookout for ideas no matter where I am. To this end, I find it’s important to always carry a notebook with me so that I can jot ideas down. 3. How does designing fit in with the rest of your life? Is it a full time job, part time job, or other? If you do a different job full time, is designing at all related? I’d call knitwear design my part-time job. My full time job is running Stitch Sprouts. For whatever reason I still feel guilty spending a whole day knitting, even if it’s for a deadline. So pulling orders, updating the website, editing, and other computer work is what occupies my workday. Luckily everything I do is yarn related in some way which makes work feel less like work. 4. Publishing a book is very exciting! Do you know what’s next for your design line? Books are very exciting, and rewarding, as I’m sure you know having just published one yourself! Next I’m choosing to focus on expanding the pattern support for Stitch Sprouts. I’ll be developing some pamphlets, patterns, and also more class kits. Of course, I also have another book idea simmering…so that could happen too! 1. When/If you’re going to knit just for fun what do you look for in a pattern? I don’t really get to knit much for fun anymore. But when I do, it’s usually socks. 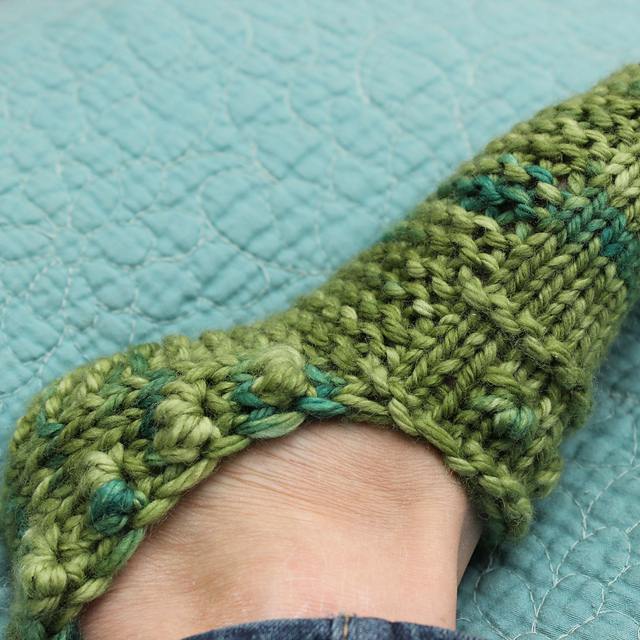 I love making and wearing hand knit socks. For these I like to choose wild and fun yarns and just do a plain vanilla pattern to let the yarn be the star. Other patterns I might make end up being quick and easy things intended as gifts. Hmm, that’s a hard question. I really do love and appreciate so many designers. Right now I’m loving everything that Jared Flood is doing. Yarn, patterns, and collections, I love it all. He has an understated elegance that is both classic and modern. I like to get lost in a good story, so when I’m not knitting, reading is at the top of my list. In fact, I’ve even learned to read while knitting! Besides knitting, I enjoy other fiber arts such as spinning, and crochet and like to use these as relaxing non-work activities. Circle sweaters flatter all body types, and Stevens is no exception. This circle vest begins in the center with a shawl cast-on, which grows into a large flower medallion. Its edge features a reversible cable so there is no wrong side when the collar is folded over. Back Width: About 16¾ (17¼, 18, 18¼, 19, 19¾)” (42.5 [44, 45.5, 46.5, 48.5, 50] cm). Vest shown measures 16¾” (42.5 cm). Cabling, while beautiful, is typically only shown on one side of the fabric. This works for most applications, however, occasionally you want to see cabling on both sides. The cable is only viewable in the knit stitches while the purl stitches hide the crossing. To combat this, the easiest fix is to work the cable in rib. This way knit stitches are on both sides of the fabric and so we can see the crossing on both sides as well. The cables on the outer rim of Stevens utilize these ribbed cables so when folded over at the collar, there is no wrong side. Every year around the Indie Gift-Along I like to do some GAL inspired features. I’ll talk about some GAL patterns I love and GAL designers who inspire me. Today I’ve got an interview with Triona! I’m always on the lookout for things to inspire my designs! I’m an incorrigible Kinnearer (see the Yarn Harlot’s extremely informative post for an explanation of the term). Sometimes I think I wouldn’t design anything without my trusty iPhone. I take pictures of interesting clothing and accessories, architectural features, nature, fences, rugs, and lots more. How did you first get started designing? I bought a sweater in Paris because it was freezing there in December. While I wore it a lot after I got home, there were all these things I didn’t like about it. It was boxy with no waist shaping, had an unflattering neckline, and the cables were all out of proportion. So I decided to design my own roughly-inspired version. 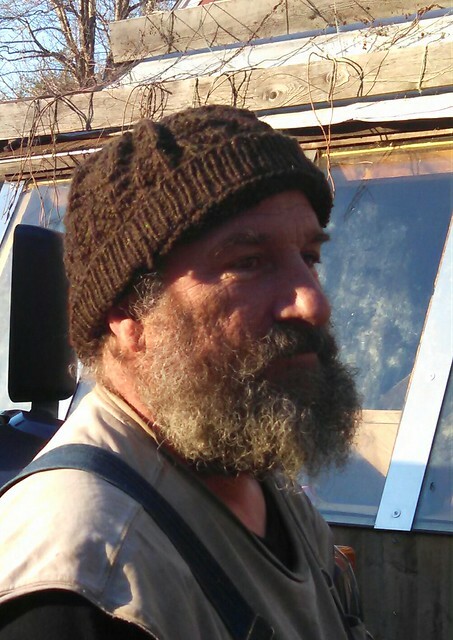 When I posted it to my Ravelry project page, I was really surprised when a whole bunch of people said they would purchase a pattern for that sweater. I had just left my job and had some time on my hands, so I studied every pattern I could get my hands on and then gave it a shot. 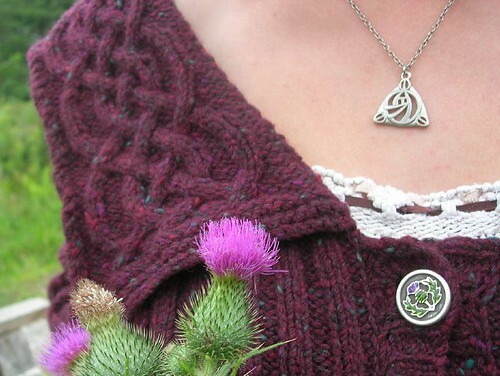 That sweater (Chandail) is still my most popular pattern to date! I love knitting hats, especially in worsted weight. They’re the perfect vehicle for messing around with new stitch patterns, and they’re always done before I have time to get tired of the pattern. I’ve been working on writing sci-fi novels for children and young adults for a number of years now. I’m hoping to get published someday! How many years have you been in the GAL? When/how did you first hear about it? This is my third year participating in the Gift-A-Long. I loved the concept right from the beginning. Now it’s when I give myself permission to knit patterns from other designers, so it’s rapidly becoming one of my favorite times of the year. 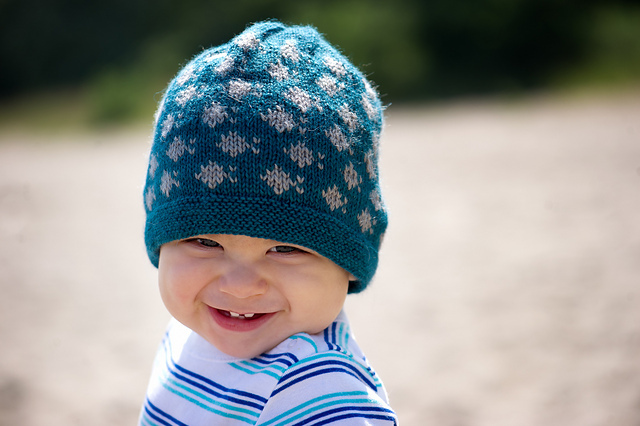 I just released a new hat pattern last week, Land Under Wave, that I think is perfect for gifts. 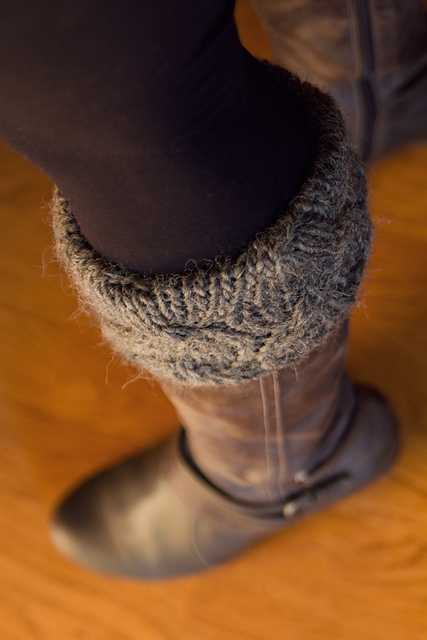 Since it’s knit in worsted-weight yarn, it can be worked up in just a few evenings. Name one thing you hope to finish during the gift-along. Or, if you’re not knitting gifts this year, what’s one other designer’s pattern you WISH you were knitting? I’m going to knit myself a pair of cute cabled fingerless mitts for sure. If I have time, I’m hoping to find a small steeking project—I’ve never tried steeking before, and this seems like a good opportunity! 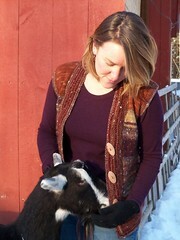 Today’s interview is with Meg of Meg Roke knits! All her lovely designs can be found on Ravelry. Remember that all designer’s for-sale patterns are qualified for our knit and crochet -alongs where you can win both digital prizes and lovely physical prizes! Join us on Ravelry. Becky: Where do you find inspiration for your designs? Meg: I “see” stitches everywhere I go. Truly. Ideas will just pop into my head from nature on a walk through my neighborhood, from the the print of colorful fabric, or even from clothing designs from an old movie. Even this morning, at my son’s library group, the concept for a new design bubbled up while watching the children play. Becky: How did you first get started designing? 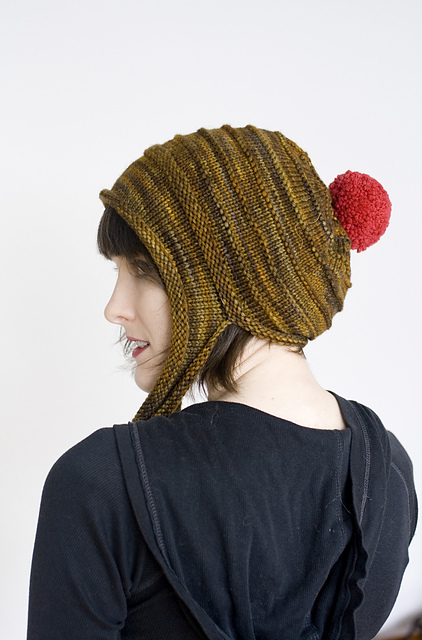 Meg: Several years ago, I was hunting through Ravelry for a simple hat with a cabled rim. I just got this idea into my head that I really really wanted to knit a hat with a horseshoe cable and could not for the life of me find one! So I sat down and began working on my first design… then it just spiraled from there. Becky: What’s your favorite thing to knit? Meg: As much as I love the beauty and complexity of challenging patterns/designs, I really prefer to make simple items with just a hint of interest or challenge. I am both a process and a product knitter. I get really swept up on how the finished knit will look, but at the end of the day I think the greater pleasure comes from the relaxing and rhythmic motions of simple knitting. I gravitate toward accessories more than anything – cowls, hats and mittens (for adults and kiddos). I love knit sweaters and socks so so much, but do not get around to knitting those as often – only so many hours in the day! Becky: What do you do in your down time? Meg: What’s down time? Ha, just kidding. I sew a little (mostly square shaped items) and love baking too. There is always some kind of baked good under a glass dome on our kitchen counter. I confess I am also a TV/movie addict, especially period piece and mystery movies or shows. So if I’m knitting, I’m on the couch in front of the TV. Becky: When/how did you first hear about the gift-along? Meg: I have two good friends who are also knit-wear designers (Andi Smith and Andrea Sanchez) and they both encouraged me to pursue it. I’m so glad I did! This whole experience is turning out to be great fun! Becky: Pick one of your own designs that you think makes the perfect gift and tell us why you think that. 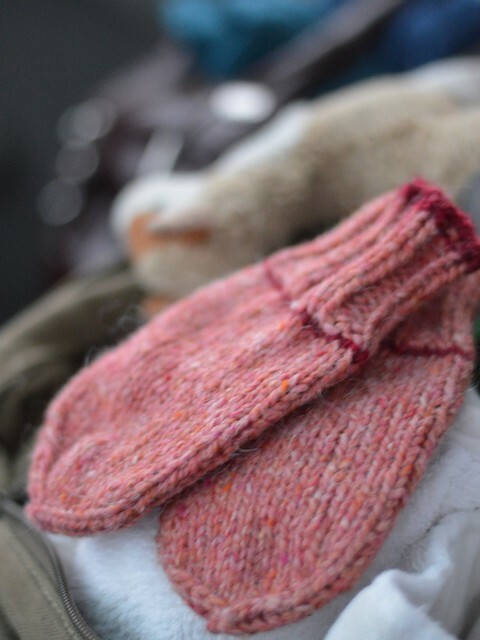 Meg: My Colorblock Mittens are a go-to for gift knitting for several reasons. First, there is a huge size range included (child’s small to men’s) so you can make a pair for everyone in the family. 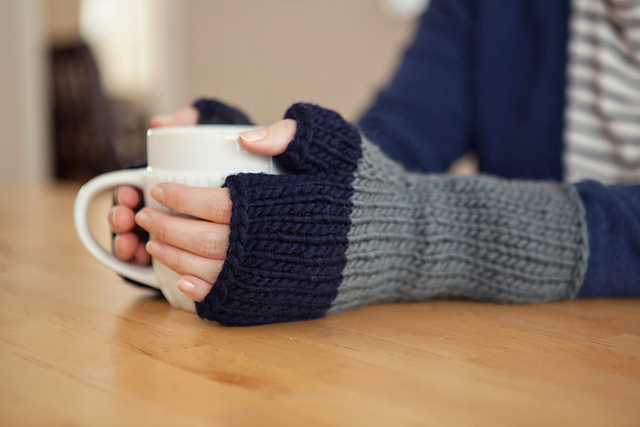 Second, the pattern actually includes TWO patterns: fingerless mitts and full mittens. Third, a pair of adult fingerless mittens can be made in a few hours (or couple episodes of Downton Abbey) because this design calls for bulky yarn. Big needles + big yarn + small project = fast knitting. Becky: Name one thing you hope to finish during the gift-along. Or, if you’re not knitting gifts this year, what’s one other designer’s pattern you WISH you were knitting? Meg: I did start a GAL project this week and will definitely finish this cute little hat for my son, Tommy. The pattern is called Sardines by Andrea Sanchez and is a slouchy hat with with sweet little fish all over. I fully intend to start and finish another pattern that I’ve had in my queue for a while. 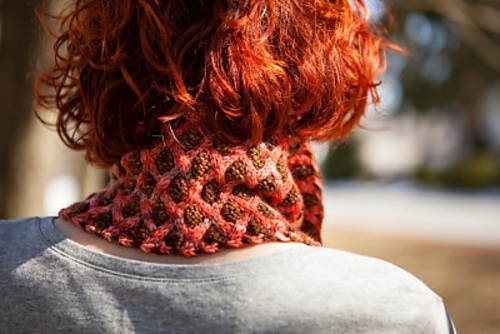 It is a cowl from a gorgeous collection of two-color-cabled accessories. The cowl is called Black Bunny by Andi Smith. I still have to pick out yarn for that though. Aw shucks, yarn shopping. Becky: Yeah, I have Black Bunny in my library too! I love how it looks with variegated yarn for the cables. 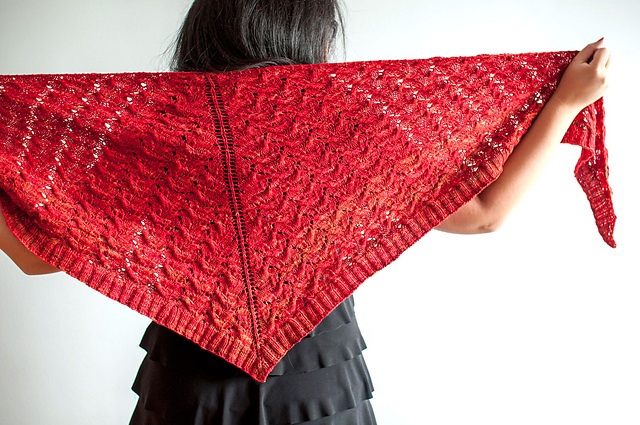 And how often do you find an intricate pattern that looks GOOD with variegated yarn?? I’m super-excited to share today’s interview with you all. I had the opportunity to speak with Laura because she’s also participating in the gift-along! You can check out her designs on Ravelry, and her blog over at her website: Laura Chau. Laura: Is it cliche to say everywhere? I had a bit of a time when I was trying to emulate things I saw in fashion magazines, but knitting takes so long it just never really worked out to be on trend. Nowadays I’m really trying to work more on coming up with my own ideas for shapes and textures. I love yarn, so a lot of the time I buy the yarn and wait to see what it wants to become! Laura: I started knitting seriously in university and got a job working in a yarn shop shortly after that, so I learned quickly! I was surrounded by awesome yarn and awesome knitters with loads of ideas. I knit quite a lot of things before I first decided to design a sweater for myself – we had gotten in a yarn that I LOVED, Artyarns Supermerino, and I wanted a sweater that I couldn’t find a pattern for. That one become Lucy in the Sky! 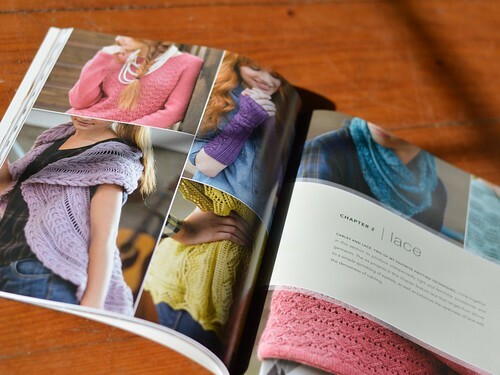 At around the same time, Amy Singer of Knitty asked me to design a lacy cardigan for the magazine, which I was thrilled to – that one is Serrano. Becky: Ah… 2006. That was when I first discovered online patterns. I think I printed Serrano out and saved it somewhere in hard copy. You know, back in the days before Ravelry when it was so hard to keep track of online patterns. I’m afraid all this reminiscing about the past is making me sound old! Laura: I enjoy knitting pretty much anything, but I love knitting sweaters so much it might actually be a problem. Laura: I spin, and am trying to get more into sewing both clothes and quilts. I also love to cook and bake. In the summer I try to grow veggies on my front porch. Becky: Now about this GAL thing. When/how did you first hear about the gift-along? Laura: I think I heard about it last year, but it was too late to join in the fun. I really wanted to be on top of it this year! Laura: Orbital Ornaments! 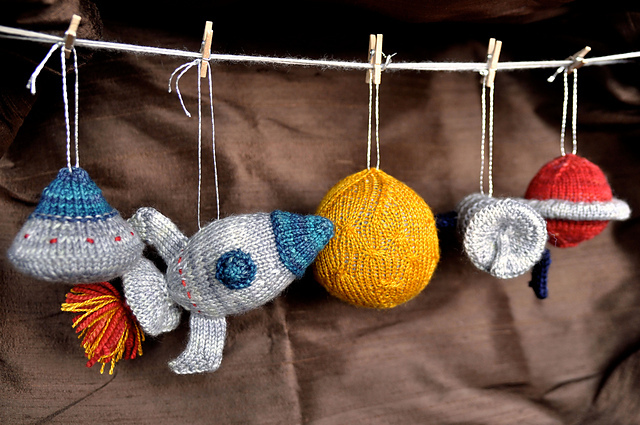 I especially love the rocket ship, and I had a great time flexing my creative knitting muscles to design them. They’re perfect for the tree, or a mobile, or just as decorations around the house for space lovers. Laura: I’m knitting a laceweight version of my Bestellen shawl that I’m hoping to give as a gift, but I don’t want to put too much pressure on myself to finish. I don’t have fun if I’m trying too hard to finish on a deadline! 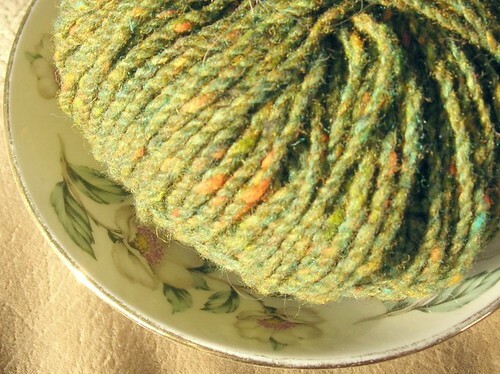 I wish I was knitting Wainwright by Bristol Ivy for myself, she is ever so smart. Today I’m excited to introduce you to another designer from the Indie Gift-Along. Here’s my interview with Claire. Claire: The majority of my designs are inspired by nature, I’m lucky to live just minutes from the countryside. My local area has been inspiring artists for hundreds of years, John Constable painted his landscape pictures just up the road from where I live including his most famous work The Hay Wain. Claire: It all started with my son wanting a hat with trains on, I couldn’t find a pattern so I wrote my own which turned into the choo choo beanie. Claire: I go through phases, in the past few months it has been hats, but just recently I’ve been focusing on sweaters; anything with cables is probably my favourite thing that the moment. Becky: What do you do in your down time besides knitting? Claire: My free time tends to be taken over by my sons, but when I get a chance I love Japanese number and picture puzzles like kakuro, hitori and hanjie. Becky: Now about this GAL thing, how did you first hear about the gift-along? Claire: I stumbled across the GAL last year whilst it was already in action, it looked like great fun so when I heard that it was going ahead again this year I signed up to join in straight away. Claire: As it is starting to get colder up here in the northern hemisphere I’ll chose As Autumn Leaves, knit in worsted weight yarn its a great shawl for wrapping around your shoulders to keep out the cold, the heavier weight yarn also means that it is a quick knit shawl if you need to make a gift in a hurry.